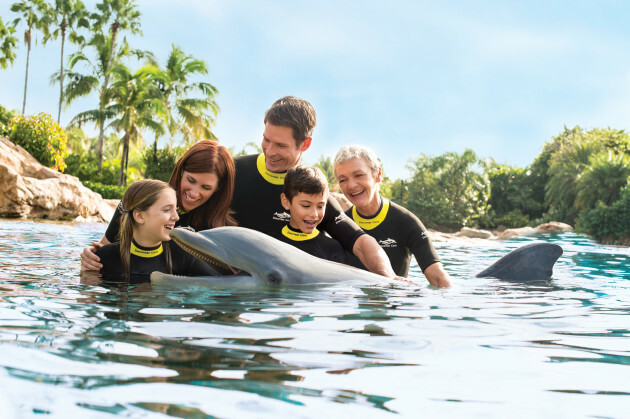 Orlando, FL, USA (March 10, 2016) — With a few mouse clicks, Discovery Cove guests can now transform a single-day experience into an entire vacation that includes accommodations at one of the park’s official partner hotels. Discovery Cove Vacations, a new online booking tool, allows guests to design a custom-tailored package that meets their specific travel needs. All packages start with a day at Discovery Cove, an all-inclusive resort park best known for its dolphin swim experience. Once they’ve planned their visit, guests can add a hotel stay in one of 16 partner hotels, many within walking distance. All packages include unlimited admission to SeaWorld Orlando® and Aquatica, SeaWorld’s Waterpark™, for 14 consecutive days around the date of the reservation, as well as reserved seating at SeaWorld’s shows, 10% off dining and merchandise purchases in the park, early park access on select days, and one Cup that Cares, a build-your-own personalized penguin-shaped character cup available exclusively at SeaWorld’s Antarctica – Empire of the Penguin. In addition, guests who chose any of the Official Hotels of SeaWorld also receive front-of-line access on rides, complimentary transportation to the parks, and access to the exclusive SeaWorld Rescue Tour, a behind-the-scenes look at SeaWorld’s rescue and rehabilitation facilities. All hotels also offer a fifth night free. The average savings for a family of four is as much as $400. Discovery Cove is a one-of-a kind, highly interactive marine park where guests swim with bottlenose dolphins, snorkel among thousands of tropical fish and rays, and play in a fresh-water river. The all-inclusive day resort also has an on-site aviary where guests hand-feed exotic birds. Guests can help themselves throughout the day to freshly prepared meals like sweet Hawaiian chicken, fire-grilled fish and burgers, summer salads and homemade mac-and-cheese. Snacks as well as beer, wine and frozen daiquiris are available all-day to guests. Wetsuits, snorkel gear, showers and changing facilities, towels, lockers and environmentally safe sunscreen are complimentary. Private cabanas with hammocks, lounge chairs and a well-stocked fridge are available for an additional fee. To book a Discovery Cove Vacation or get additional information, go to DiscoveryCove.com/Vacations.